The king reigning at the time of Daniel 5 is Belshazzar. Actually he had a co-regency with his father, Nabonidus (556–539 B.C.). In the context of Daniel 5, the 70 years of captivity which began in 605 B.C. are almost complete. Daniel, who was a youth as the book begins in ch. 1, now would have been an old man. When Belshazzar made a drinking feast for a thousand of his nobles, they were drinking wine out of the gold vessels taken from the Solomonic temple in Jerusalem (at the 586 B.C. destruction by Nebuchadnezzar). This is when the fingers of a man’s hand emerged, writing on the plaster of the wall of the king’s palace. The terrorized king, at the suggestion of the queen, called for Daniel to interpret the writing on the wall. He offered Daniel clothing of purple, a chain of gold and third place in the kingdom, if Daniel would give the interpretation. This stele of Nabonidus, was discovered in Haran. He holds the scepter, while worshipping three deities, represented by the moon, the sun, and Venus. The deities represented are Sin, Shamash, and Ishtar. Nabonidus spent much of his time outside of Babylon and was out of touch with his administrative duties. 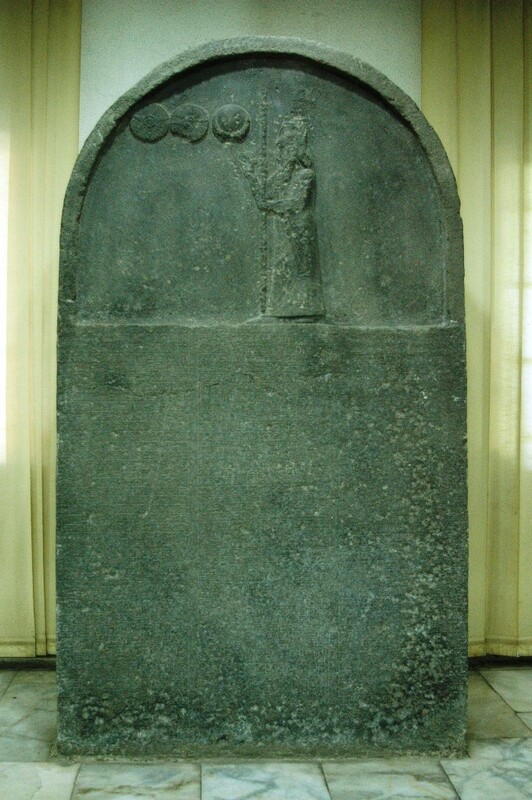 Nabonidus Stele. Discovered at Haran. Photo by Leon Mauldin. This entry was posted on Friday, June 29th, 2012 at 9:49 PM and is filed under Bible History and Geography, Bible Study, Old Testament, Travel, Turkey. You can follow any responses to this entry through the RSS 2.0 feed. You can leave a response, or trackback from your own site.